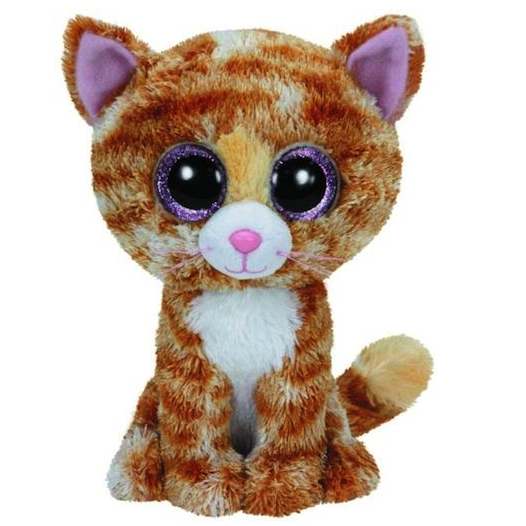 Tabitha is made from a fuzzy orange and white striped material with a white belly and muzzle. She has large, glittery purple and black button eyes and a pink button nose with a pink thread mouth and whiskers. She has lilac coloured material inside her ears and a pale orange tip to her tail. Cause I’m so pretty just to look at! Tabitha was released in July 2014. Her birthday is on 17th December. There are two versions of Tabitha. This small 6″ Beanie Boo and a medium 9″ Beanie Boo Buddy.